Actually I’m not sure how this little place is called as of this writing, so I just dubbed it as “Cebu City View by the Bay”. If I show you even just one picture of it, I bet you say you’re familiar with the place. If you’re a frequent traveler passing through SRP when going back and to from the city proper to south like Talisay, Minglanilla, SM seaside, Lantaw SRP.. you always pass by this little plaza by the bay. 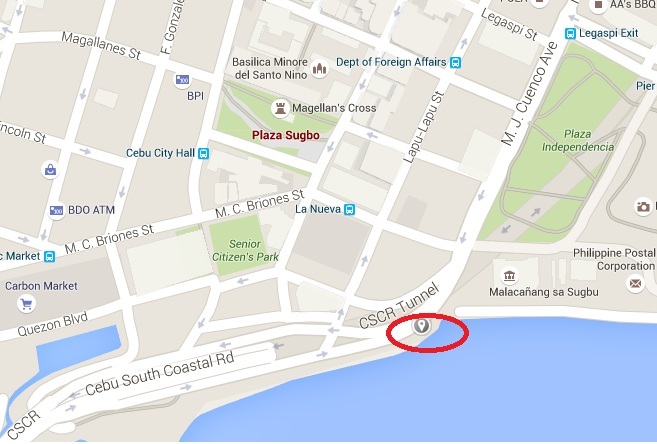 The entrance is a small paveway right after you pass Plaza Independencia then to Malacanang sa Sugbo then go to the left (sea side). If you bring a car, you cannot park it here but you can park it in the old white abandoned building just across to it. It’s the white structure you can see in the gallery. Encircled with red above is the exact location. It’s morning when we went here, right after morning session of jogging near the Quad building, so mr. sun is above to shine. It’s still relaxing to watch the street, actually it’s the SRP viewed from here since it was Sunday and basically some office workers are off and students have no class. On the other side is the the bay view. 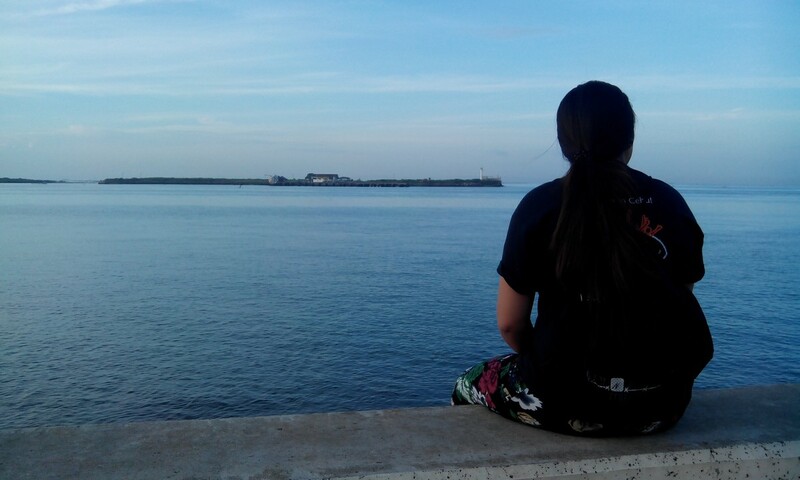 The sea is calm and the sky is clear. You can see the inlet as if you can swim towards it. This is the part of the inner ocean where boats both passengers and cargoes pass by. Coks enjoying the scene and looking a boat owned by 2GO coming towards. We’ll the place is not pretty that maintained and you can’t expect and treat it as a tourist attraction but it’s good place to pull over early mornings. Be aware also that there are people who let their nights pass here by and also people who perhaps don’t have home who sleeps their night over here.